Take your off-road experience to the extreme! 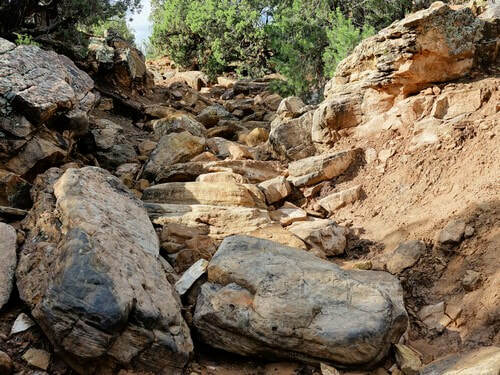 This is one of seven rock crawling trails located just a few miles west of Montrose, Colorado, in the Dry Creek Rock Crawling (DCRC) area of the Uncompahgre Plateau. Vehicles using these "Full Sized Trails" are required to display an Off Highway Vehicle Pass. See StayTheTrail.org. The Scratch and Dent trailhead is on the entrance road to Calamity Canyon, about ¼ mile from Rim Road. There is a small sign to the left at the bottom of the first small draw, indicating the start of the trail. The trail continues up the draw and is mostly smooth sand and a few small boulders. At about ⅓ mile it passes through a fence with a gate (please leave gate as you found it). About 100 yards past the gate, the trail begins a rocky section that climbs up out of the draw. The rocky section continues for about 100 yards. When you get to the top, turn left and continue for about ¼ mile to the Calamity Canyon entrance road. Turn right to return to Rim Road. These rock crawling trails are beyond our capability so we have not recorded tracks for any of the actual trails - only for the roads that access them. The track at the end of this page was taken from Google Earth. It should be very close. I walked a short distance into each trail to get a photo of one obstacle to include on this website. The obstacle pictured may or may not be the hardest, but it is the closest. 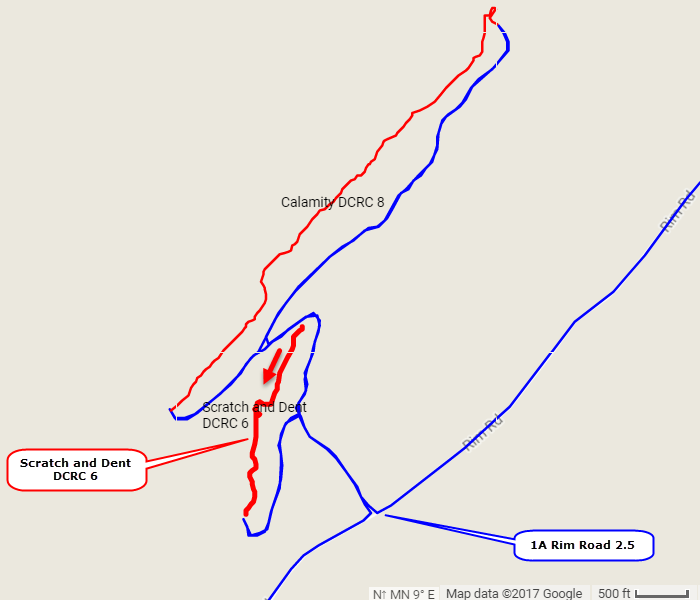 All descriptions and ratings are from a Montrose website.​ ​All trails are rated on a 10 point scale and were rated by whoever set up the area, not by JeepTheUSA. ​​This trail is accessed by Rim Road 2.5.